Is sharia a threat to this country that must be stopped, or a matter of religious freedom that should be protected? An aggressive anti-sharia campaign in the United States has recently placed this question squarely (and repeatedly) before the American public. Unfortunately, most Americans have very little credible information with which to answer it. Those who try to find out about sharia themselves have to wade through multiple definitions and counter-definitions. With little to no background to help sift fact from fiction, acquiring a clear understanding of the subject is nearly impossible. American Muslims face many of the same frustrations. Because the typical Muslim generally needs to know only the particular rules by which he or she has chosen to live, most are unequipped to discuss sharia at the macro level at which it is currently challenged. 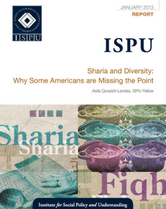 This report is for American Muslims who want to better understand sharia in order to explain it to others, and for non-Muslim Americans who seek an explanation of sharia at a higher level of sophistication than is available in popular media. It should be noted that this report does not seek to change the minds of anti-sharia advocates or to provide point-by-point responses to their propaganda. Rather, it seeks to provide an informed exposition of some basic concepts of Islamic law so that Americans can intelligently engage in and raise the quality of this ongoing public conversation.